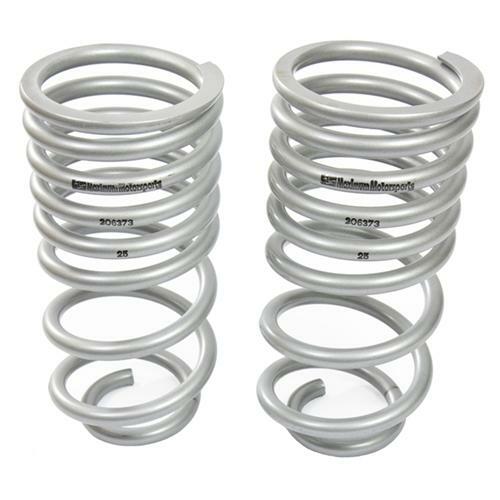 Stiffen up the suspension for the rear-end with these high-rate springs from Maximum Motorsports to compliment your 1979-2004 Mustang's Coil-Overs! If you are looking to beef up the rear suspension of your 1979-2004 Fox Body, SN95, or New Edge to match the coil-overs that you have on the front; these high rate rear torque arm springs from Maximum Motorsports are exactly what you need. This kit includes (2) high-rate torque arm springs. With a 415-515 lb/in high spring rate, these springs are exactly what you need for an aggressive coil over set up on the rear of your Mustang to get cornering to its peak performance. Maximum Motorsports it known for their superior quality and road-racing performance parts better than any other. Late Model Restoration has exactly what you need to get your suspension ready for the track! These springs are intended for the use of high-rate front coil overs and a rear torque-arm suspension system.